Tata..... Another weekend bento using my new Multi-purpose Mickey Mouse tools which I have bought recently. With the left over ham from making yesterday Bear Hamroll. 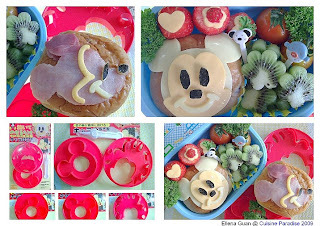 I use a slice of it to make one of the mickey mouse side face and my dear son was thrill when he saw this Mickey Mouse Bento. 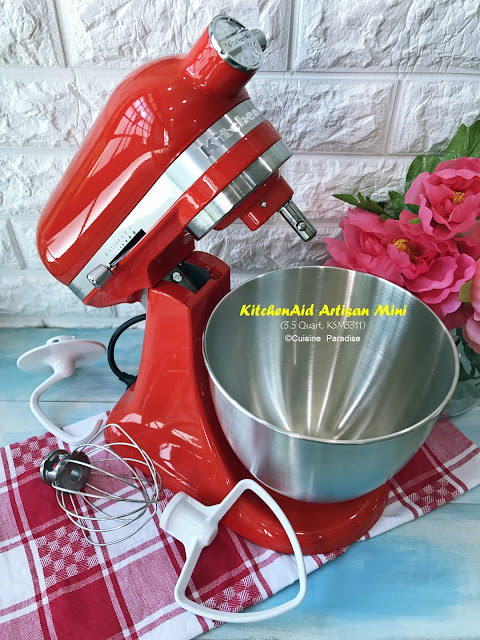 This set of Mickey Mouse design multi-purpose cutter come in a pair of two different mickey mouse design which enable you to cut out the head and face features. 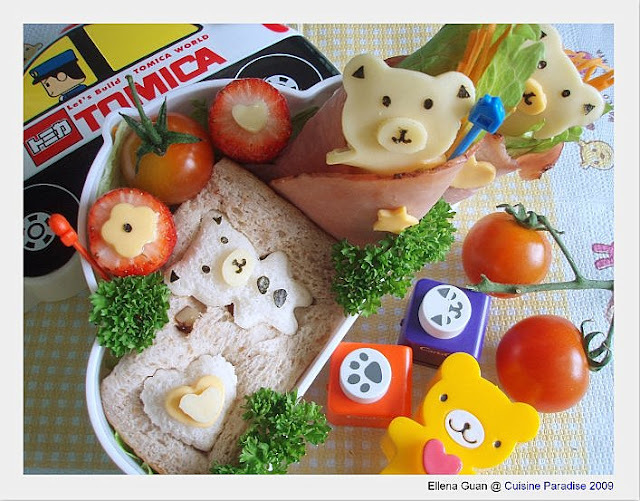 I also have another similar Pooh Design set which I used to make the Ham & Cheese Bear Sandwiches in another bento. Some weeks ago, one of our church members bought some desserts to my mum and she told me that it is very special as she had not eaten something like that before. 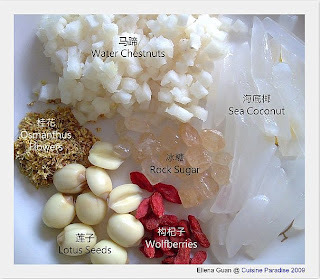 From what she mentioned, the ingredients include lotus seeds, chopped water chestnut, wolfberries, egg white and most important Osmanthus flower which gives this dessert it unique fragrant and taste. So from what she had mentioned to me, I come out with my own version of Osmanthus, Water Chestnut & Sea Coconut Dew. Yup, for my version, I have added some shredded Sea Coconut to it. It had being long since I used fresh sea coconut to make soup or dessert. 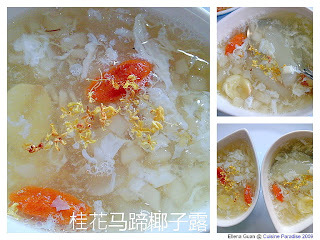 And I must admit, this is a very refreshing dessert which have a very nice tangerine taste due to the Osmanthus Flowers. 1. Wash and peel off the skin of the fresh sea coconut (try to select the soft to touch type which is more suitable for making dessert) then cut into thin strips. 2. Bring half small saucepan of water to boil then add in the lotus seeds and simmer on medium low heat for about 7 - 10 minutes until the seeds are soft. Dish up, rinse and remove any germ inside the lotus seeds to prevent bitterness then marinate with the sugar and set aside. 3. Next bring the pot of 800ml water to boil, add in rock sugar, sea coconut, wolfberries and osmanthus flower and simmer for about 10 minutes. 4. Use a strainer, remove most of the cooked osmanthus flower away then add in the chopped water chestnut and marinated lotus seeds and simmer till boiled then switch off the heat. 6. 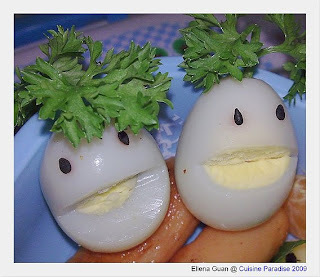 Serve it with some extra osmanthus flower either warm or cold. a) You can replace dried lotus seeds with those vacuum packed fresh lotus seeds instead. b) You can either soak the dried lotus seeds with boiling water(without washing the seeds) till soft then cooked together with the sea coconut and rock sugar. My dear son had being down with flu and cough bugs for the past 2 weeks plus and just a few days ago, he was also down with high fever and bad cough. But thank God after the 3rd visit to the doctor and change of medication he is getting better today. 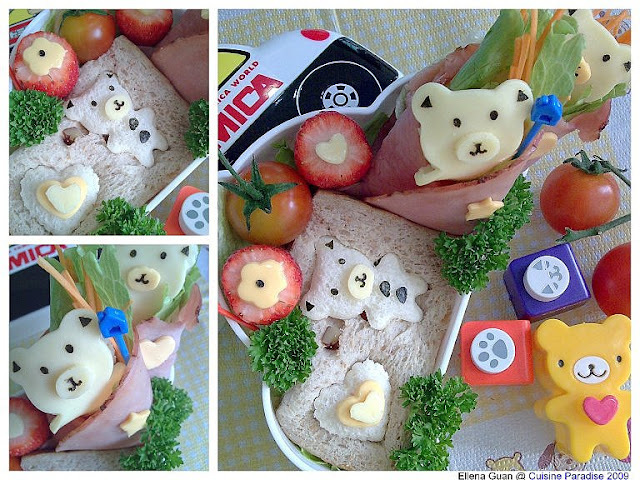 So while he was doing his homework I secretly prepared this Bear Bread & Hamroll Bento in our new purchase Tomica Lunchbox. I hope that this artwork of mine will be able to cheer him up and as well to increase his appetite by the look. This bento is divided into 3 parts. On the left side is a bear and heart shape cutout from two different colour tone of bread to make the contrast. Next I use the Caral Mini Craft Puncher (click here for details) to punch out the features of the bear using nori sheet. 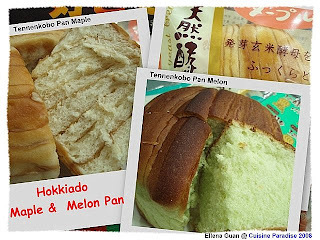 On the right side, I use the apple baked ham, lettuce and shredded carrot to make a cheese bear hamroll (click here for cutter use). 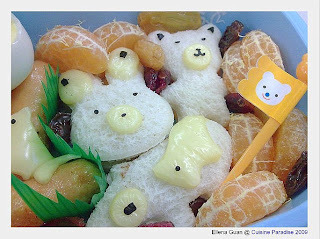 In order to make it more eye catching, I also use two tone colour cheese to make the features of the bears and also with some added cherry tomato and strawberries to make it more colourful. Lastly, I decorate it with some added parsley to make it look more like a garden with some greens. Usually Sunday will be a picnic day for most of the family to laze around in the park and enjoy the morning/evening breeze and warm sunshine in order to have a fun and relax family getaway. Like other families, Reyon and I love to prepare some of our favourite snacks and get relax in the neighbourhood park. Although we do not have those luxury park like those western countries but we do can enjoy a bit of peace and wonderful family bond in the weekend. 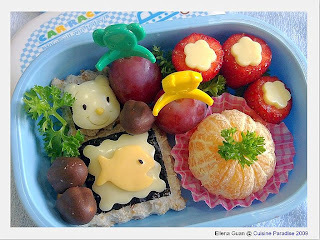 Today is Valentine's Day and since we are out in the morning for excursion, we will have our Weekend Bento as Snack today on Valentine's Theme. Em.... I have being thinking of what to make for Reyon on this special day and there are so many ideas in our discussion lists. Finally in the end, we agreed on this simple and quick theme because he is so hungry to have his snack before I can snap more pictures on it. 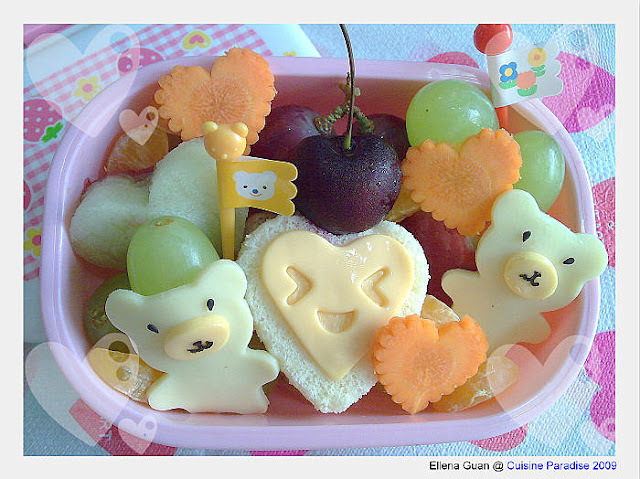 In today's snack bento, I have include a heart shape cheese sponge cake in the middle, following by two little cheesy bear and some extra red and green grapes. 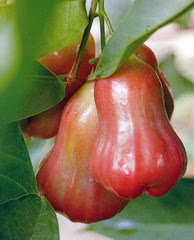 Other then grapes, cherry and tangerine, I also introduce a new fruit to Reyon call the Red Rose Apple. It's kind of crunchy and sweet in texture but Reyon doesn't seems to like it and he just had a bite to try on. Heard a lot of good comments about this International Catering Pte Ltd service, so I decided to give myself a short break from cooking dinner. I cater for a Trial Period of 10 Days meal which the delivery man will sent the dinner on every Mon-Fri Evening except Public Holiday. 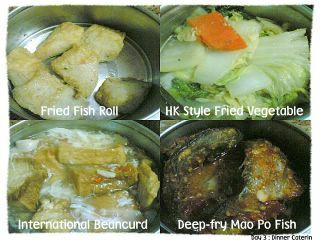 These are some of the foods that we had for the past three days of trial.... The food to me is consider as average, you can't except too much on this kind of homecook catering food. 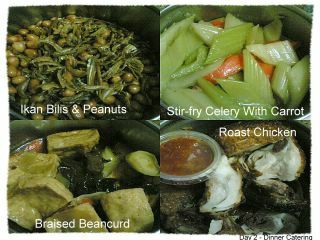 It's a Hala Menu and you won't find any pork in everyday dishes. 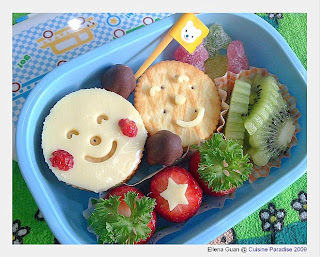 Despite that I am not feeling well today, I still come out with this afternoon snack bento together with Reyon's help. 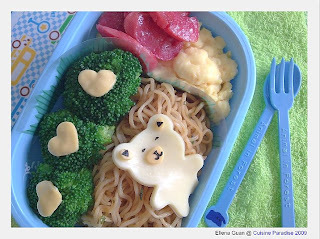 Today he wanted to have a Garden theme after seeing Amy's Bento (Shopping Mum) for her kids on caterpillar. 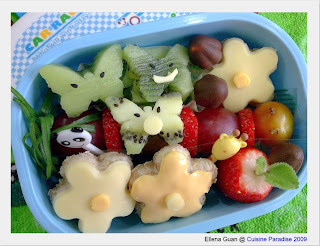 So after discussing with him, we agreed to have caterpillar with fruits and cherry tomato, butterfly and flower bread with cheese for our Garden Bento. Can you spot the caterpillar? We actually, use red grapes, strawberry slices and 1 cherry tomato for the head and I thread them together using a wooden skewer and place some spring onion curls as the tail....... These two beautiful butterflies are done by Reyon. 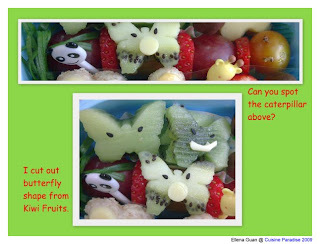 He helps me to cut the butterflies out from the kiwi slices and stick the eyes using black sesame seeds. As you read from my blogs, you actually knew that Reyon loves to collect recycle envelopes and he indeed have a wide collection of envelopes. He even made a little Post Box out of a recycle parcel box. 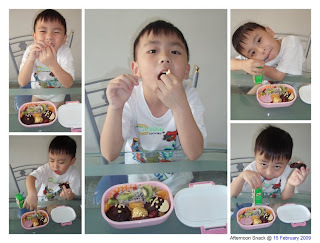 Since I am not feeling well today(down with sore throat and fever), I don't really have the strength or idea on what to prepare for Reyon's breakfast bento. So I just fix a quick bento by preparing Stamp Bread using the new 2 in 1 Zigzag Cutter that I bought. This morning Breakfast theme is on Smiley Face because Rey is feeling better today as he had down with flu for about 4 days. Yesterday he choose to have a sad and dull face for his Pizza Boy while today, he requested a Smiley Face on his jam sandwich Ritz Crackers. 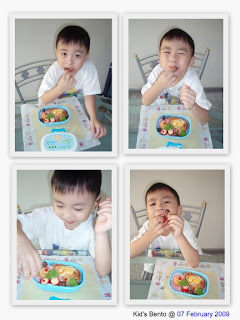 Look at this cheeky boy on the pictures, he still can pose so many interesting expression while taking his breakfast. On the 2nd picture in the 1st column, you can see that he is choosing which item to start with. 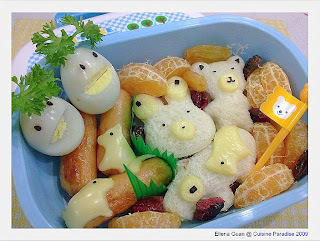 Although making these bento are a bit time consuming but then it's full of fun when you see your kids eating them with joy. Since Rey is not feeling well, he requested for something light but not porridge for dinner. So I decided to give him some noodles, blanched broccoli, scramble egg and mini taiwan sausage as his dinner. 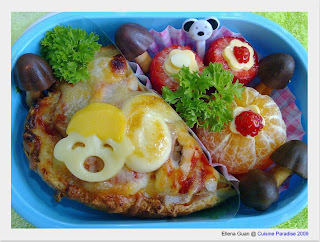 This morning, I made this set of Pizza Boy bento for Reyon. Since he is down with flu these few days, he requested to have a boy with a sick face on it to show that he is not feeling well. I add in some strawberries and tangerine for him to make the bento more colour to lift up his appetite. To make him happy, I also add in some chocolate mushroom caps on his request. 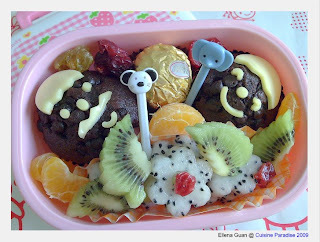 This is an interesting design as Reyon requested to have a Jungle Theme Bento Snack for School. So we came out with this ideas of making some Forest Animals, logs and Trees. 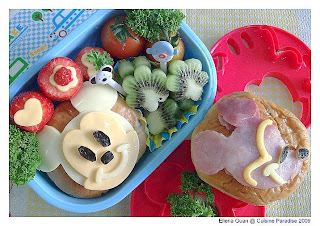 Actually I still thought of adding some Toadstool Mushroom using Apples but then the size of the bento is quiet limited to arrange all these items in. But in the end I just slot in some tangerine slices to secure the bread from moving and stuffs some dried fruits for extra bites and colouring. 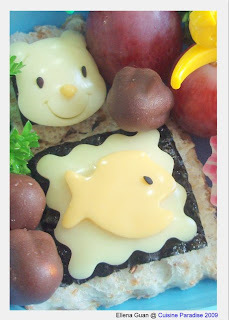 The story of this Bento goes on like this from what Reyon recites the story. He said the story is about some Foxes and Tree Monsters eyeing on the forest animals and they are planning on how to eat the little animals. The tangerine slices act as rocks for them to hide. I was at of the Japanese Retail Store in The Central Mall located directly above Clarke Quay MRT Station. The mall has a distinctive Japanese theme, with a wide variety of Japanese shops and restaurants. 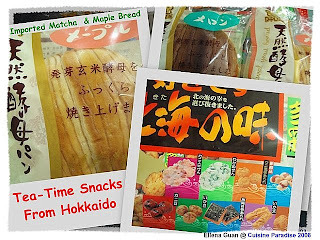 And If you are mad about Japanese snacks, food or anything related that you have being cave for months, you can go to The Central Mall at Eu Tong Sen Street. After so many days of heavy meals during Chinese New Year, I can't think of what to cook or eat for Sunday dinner. So after much struggling and thoughts, Reyon suggest that he wanted a sea creature themes on noodles. 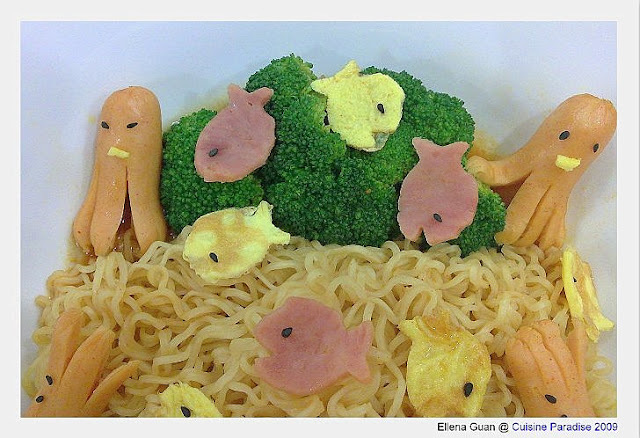 So I run through my bento accessories boxes in the pantry and come up with this....... "Seafood Noodles". 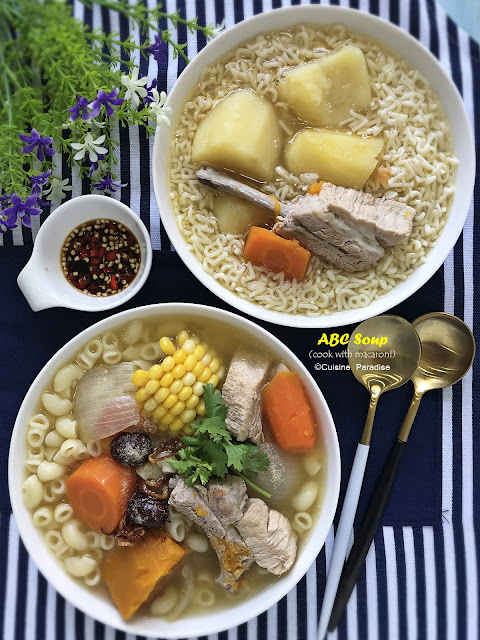 A simple Instant Noodle can be turn into an interesting meal if you put in some time and effort. It took me and Reyon about 30 minutes or less to come up with it. First, I use a small non-stick saucepan to cook the omelet and I fill it with water and start cooking the noodles while Reyon helps me to cut out the fishes from the omelet and ham. 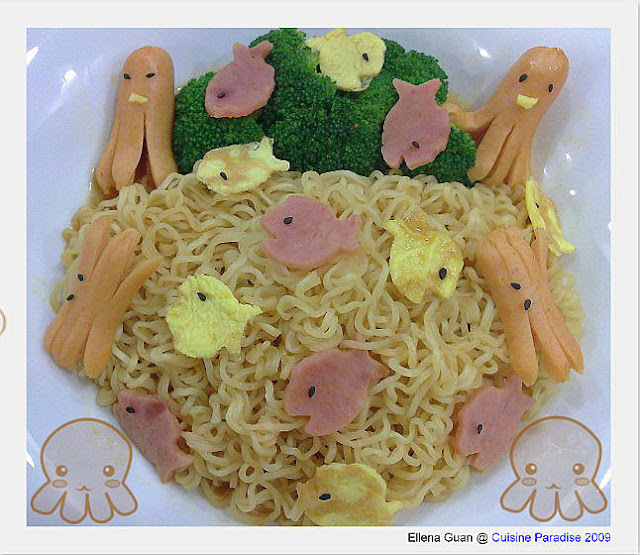 When the noodles is cooking, I cut out the Octopus and Crabs from mini hotdog. Next I removed the cooked noodles and place it on one side of the plate, then I blanched the broccoli using the same water for a while till half cooked, removed and arrange at one side to form as the water plants. Next I throw in the cut ham, octopus and crab and cooked until done. 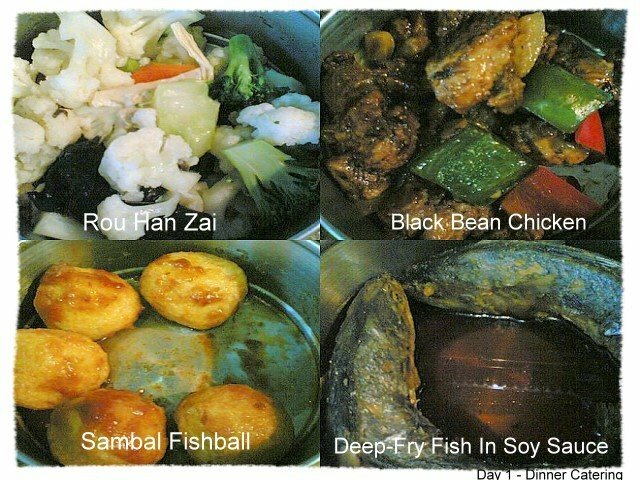 Removed the arrange everything on the plate with the noodles then place some black sesame as the eyes of the sea creatures. If you don't have black sesame seeds you can replace it with cut seaweed sheet.